How Do I Drain My Hot Tub? Even though chlorine and some safer water treatment choices help keep the water sparkling clear, hot tubs need to be drained once every three months to maintain a healthy and enjoyable spa experience. With high temperatures and an enclosed cover when not in use, a spa can quickly build up scum and crud which not only looks ugly but also clogs jets and filters making maintenance a nightmare if neglected. You may not see it but oily residue, heater scale, and grime are right now lining your hot tub's pipes and pump. If left untended, this will eventually clog your system and you may need to call a professional to clean or replace those parts. A simple flush before you drain will remove all that crud and make your system more efficient next time it's filled. Purchase a spa flush product from your favorite vendor. Add product to spa water according to directions on package. Remove pump filter and run spa pump overnight. You will notice a large amount of residue flushed from your system but make sure you don't let it sit. Drain the spa immediately afterwards to prevent any grime and scum sticking to your hot tub's finish. Do not drain your spa water into the yard or fish ponds! The chemicals, heat, and scum will kill your grass, shrubs, and fish. It will not be a permanent problem, the grass and bushes will eventually grow back, but it will leave an ugly brown spot in your lawn for quite some time. Always inspect your pump cord before use. Frayed or cracked insulation can cause electrical shock so make sure your equipment is safe before jumping into the water with your pump. If there are doubts about your equipment, you can always pump the spa dry before entering to clean. Depending on the size of your spa this process could take about an hour to perform, and cleaning as it drains prevents the grime from drying to the sides. Shut down spa at user console. Turn off breaker to spa at spa panel disconnect. 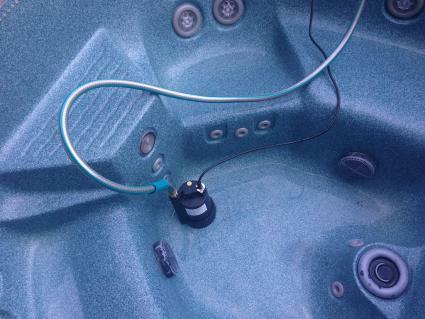 Attach hose to submersible pump and submerge to the lowest area of spa. Run other end of hose into street sewer or household drain. Plug in submersible pump and ensure water is draining. Climb into spa and clean sides with disinfectant and sponges while water drains. When water reaches lowest level where the pump becomes ineffective, unplug pump and remove from spa. Vacuum out the small amount of water remaining in the bottom. Clean and dry bottom of spa. No Submersible Pump? No Problem! You can always let gravity drain your hot tub. As long as the drain area is lower than the bottom of the spa, gravity will do the work for you. Place one end of the hose at the bottom of the hot tub. Weigh hose end down so it stays on the bottom of the spa and run the other end to the street in a straight line. Avoid dips and lumps if possible. Use vacuum to create suction on the street end of the hose until water flows out. Remove vacuum and set hose down. Spa will continue to drain by itself till the spa hose end is above the water line. Vacuum remaining water out of spa. Clean and dry spa with sponge and chemicals. It may take three to four times as long to gravity drain, depending on the diameter of your hose and the crud may impede the flow when it enters the hose, but if you have the time and want to save the money go for it. 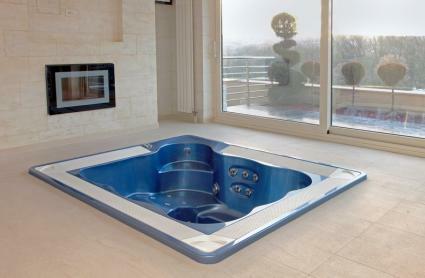 You don't want to drain your hot tub into a septic tank since it will fill it too quickly and that could be a problem. One solution would be to find a low weedy patch in your area that can handle the large amount of water and dump it there. The spa water doesn't have enough chemicals to destroy the soil forever but it will cause dead spots in your yard so don't run the waste water on your beautifully manicured lawn or bushes. Never underestimate the health value for yourself and your family when it comes to hygeine. Bacteria thrives in the worst possible environments, so be sure to add the hot tub to your quarterly cleaning checklist because nobody wants to get sick from the spa.